J Anim Sci Technol 2019;61(2):98-108. J Anim Sci Technol 2019;61(2):87-97. J Anim Sci Technol 2019;61(2):61-68. J Anim Sci Technol 2019;61(1):28-34. J Anim Sci Technol 2019;61(1):41-46. Journal of Animal Science and Technology (JAST) is a peer-reviewed, open access journal publishing original research, review articles and notes in all fields of animal science. 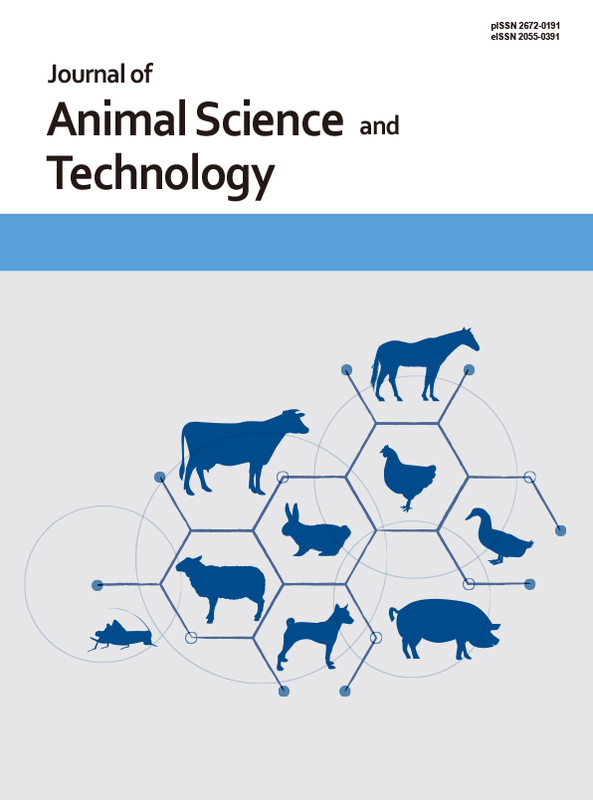 Topics covered by the journal include: genetics and breeding, physiology, nutrition of monogastric animals, nutrition of ruminants, animal products (milk, meat, eggs and their by-products) and their processing, grasslands and roughages, livestock environment, animal biotechnology, animal behavior and welfare. The journal is indexed in PubMed Central, DOAJ, Google Scholar, Crossref and Korea Citation Index.